My son is a little wild in the backseat when we're driving around town, especially when we're on long road trips. Yes, he kicks quite a bit. My husband and I have cleaned the backs of our seats one time too many. 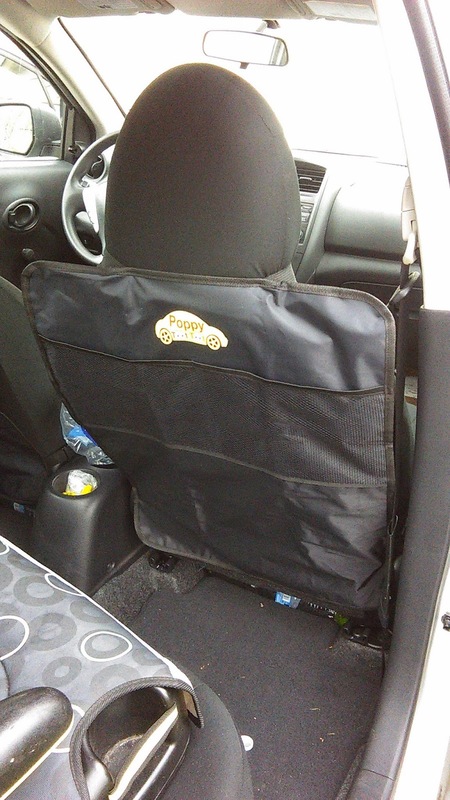 We were in need of something exactly like this car mat seat back protector. We had one in the past, only on one seat, but my mom really wanted it and so I gave it to her. I was sent a pair of bigger car seat protectors from Poppy Toot Toot. I love that this set came with TWO protectors and it is big enough to cover the entire back of the seat. They are quite a big larger than my old seat protectors. The other thing that makes us love this product is the fact that they both have good sized pockets to fit toys, books, activities, wipes, snacks, etc---whatever you want to store in them. Even better---there is also a pocket on the back of each protector as well. Super easy to clean because of the material and simple to add on or remove from your seats with its adjustable straps. This product is excellent. No complaints from my family.